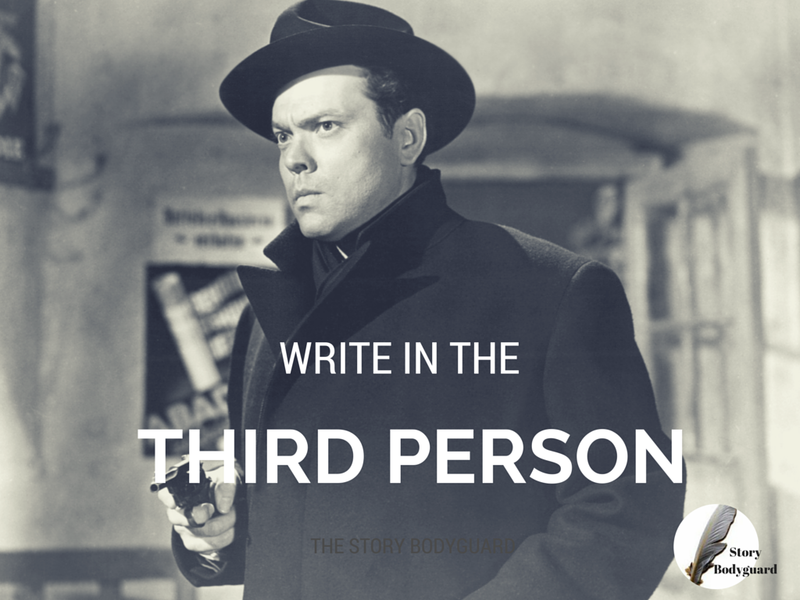 The Story Bodyguard: Why Write In The Third Person? Screenwriters use third person voice exclusively. Many narrative fiction writers start by writing in the first person using "I," and "we" and don't know how to switch. They feel that using the third person point of view is somehow distancing. One of the main reasons to use the third person voice of "he/she" and "they" is carry the voice and point of view of various characters in a longer, more complicated story. Each character is personified in a representative tone and language, but narrated in the third person. Third person voice is instrumental in a long story to sustain the story tone while creating scenes that transition between different characters. For many writers the most difficult transition is to represent corresponding emotions in third person. While writing in the first person character feelings come unbidden. But when attempting to personify those emotions, the feeling does not flow. The goal of every scene is to move the story forward. If writing in the third person is a challenge here are some ways to loosen up and get into character. Use the old adage: show, don't tell. Show the feelings in dialogue. Let your character talk it out. Write action that displays the feeling. Take a scene written in first person and transform it into third person. For each situation your character encounters, identify the feelings and then demonstrate them in dialogue and action. Record the scene as you see it in your mind. What verbs do you use to display emotion? Let your character talk to herself? How does your character respond to other characters? to physical obstacles? What minor action personifies the character's emotion in the scene? Find writers in your genre who write in third person point of view. Note how they covey tension, emotions, and actions. Copy the techniques. I hope these notes help those who are struggling with third person point of view. Special offer. The first person who can tell me why The Third Man may not have been the best illustration for this topic, will receive free Story Notes on the first ten pages of your fictional work. First or third person, narrative fiction or screenplay.